“There’s a dinghy missing!” someone at the bonfire shouted, cutting through the darkness, and instantly halting all conversations. We looked over at the dimly lit beach where we had “parked” Lagniappe, and were relieved to see the shadow of a tender that looked a lot like ours. Kimberly and I immediately felt for the people whose dinghy had gone adrift. For a cruising sailboat, a dinghy (also called a tender) is the only link to land activities. Without it, you can’t restock groceries, refill propane, check out dive and snorkeling sites, go spearfishing, visit restaurants and bars, or even get to the beach for sundowners with friends. If your sailboat is your home, then the dinghy could be considered your car. Although most cruiser dinghies are a little rough around the edges and well-worn from years in the sun and waves, they are a cherished part of all cruising yachts. They are so dear, in fact, that most people call them by nicknames like they would a child or close friend. Imagine our despair when we went to the beach for a closer inspection, and Lagniappe was nowhere to be found. We were baffled. There had been three dinghies on the beach, just thirty feet from where we were enjoying the bonfire. They were side-by-side resting on sand in very calm conditions with Lagniappe in the middle. Now, the other two dinghies looked undisturbed, but Lagniappe was gone. How was this possible? Well, we still don’t know the answer to that question. The anchorage immediately sprang into action. The VHF radio crackled with calls to all vessels to be on the lookout for a runaway dinghy. Searchlights flashed on from multiple sailboats and scanned the waters. It looked like a scene from a prison break movie. A couple of fellow cruisers, Christine and Scott, aboard the m/v Conchy Tonkin’, whom we had just met at the bonfire, told us to get in their dinghy and we dashed off, crisscrossing the entire anchorage and beyond. Other cruisers jumped into their dinghies to search, as well. 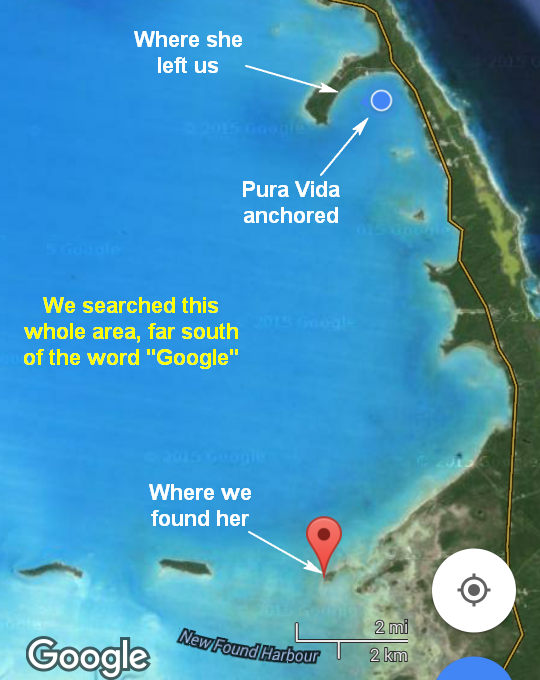 We did not find Lagniappe that night, and after circling the anchorage twice, we asked our new friends to drop us off aboard Pura Vida. On the radio, other boats were hailing us with offers to lend us their kayaks or give us rides if we needed to go to town the next day. The loss of Lagniappe left us heartbroken. If you have followed our blog and read the Bimini Blues post, you know just how much work went into rescuing Lagniappe from the sea, and getting her running again; and now she was gone. We’ve heard many stories of dinghies breaking free from their tethers, never to be seen again. We went to bed but couldn’t sleep. Outside the anchorage, the seas were building and the winds were picking up to over twenty knots. In those conditions, Lagniappe was sure to be overturned or crashed against the many rocky shores, and be destroyed. The other possibility was that Lagniappe would somehow avoid all the perils and make it to the open ocean where she would certainly be on her way to Cuba by morning. In any scenario, we would now have to cut our exploration of the out islands short, and return to Georgetown to try to buy a new tender and motor – not an easy or inexpensive task. To replace ours would have cost us over eight grand, not including the cost of having these heavy items shipped to the Bahamas by air, and paying customs duty and local taxes. In the morning, Kimberly had a great idea for a last-ditch effort to try to find Lagniappe: hire a local fishing guide. The charts and guides for this area listed one guide and his phone number. At 7:00 am we called him and he was available. When we told him our predicament, he dropped what he was doing and was at our boat picking us up within 30 minutes. His boat was a flat-bottom, open fishing boat with a single 60 horsepower motor. A great boat for fishing in calm conditions, and for getting into shallow waters, but probably not the best for going out in heavy seas and high winds. The winds had picked up overnight with a passing front, and the waves outside the anchorage were well over four feet. In our haste to start the search, we jumped aboard without noticing that the only place we could sit on his boat was a hard fiberglass bench with no cushions. As soon as we got out of the anchorage and he pushed the throttle, we knew we were in for a long and painful morning. The waves were slamming the small boat so hard that it shook violently with every single one that we passed. Our knuckles were white from gripping the bottom of the bench to keep from flying off. Over the next few hours of searching, our asses received a pounding that would leave marks and make us wish for cushioned toilet seats for several days. We apologize for the lack of accompanying photos, but we were too busy holding on for dear life. We had been out for almost three hours with no sign of Lagniappe. It was then that we ran aground. 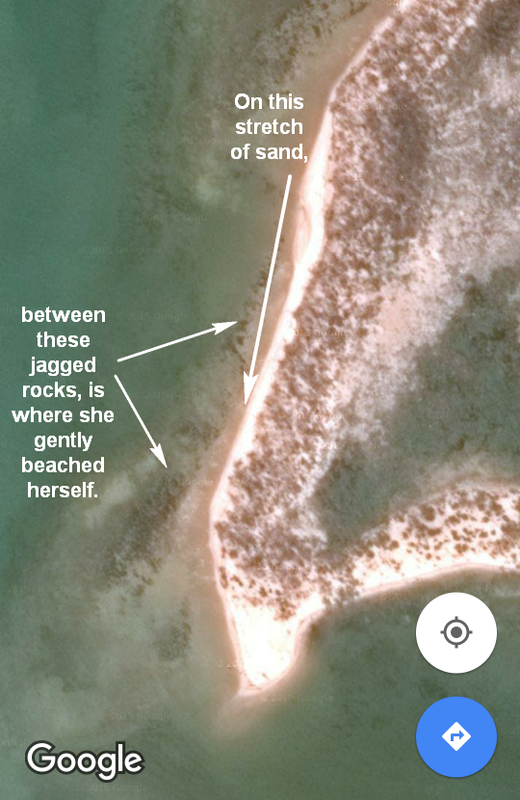 One of the search areas is a shallow sand bank that gets almost dry at low tide. It was mid-tide now and getting lower. We were going full speed and hit the sandbar so hard that the propeller dug in and showered all of us with sand. We were about ten miles from the anchorage, in the middle of nowhere, stuck on a sand bank, and our search had been fruitless. Our trusty guide acted unfazed, but I could tell he was nervous about getting stuck out there until the next high tide, over nine hours away. He and I jumped in the water and walked the boat toward darker blue water, where it is slightly deeper, and we could get underway again. With the boat floating, we continued the search along the coast where Lagniappe could have landed. It did not look promising; the shore was rocky and jagged. 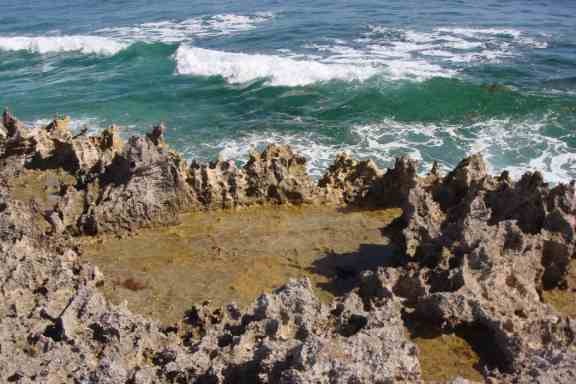 If our inflatable dinghy landed here in heavy seas, she surely would have been torn to shreds by the knife-like edges of the coral rocks. It was then that we ran aground – yes, again! By now we had the drill down and the guide and I jumped off the boat without speaking a word and started walking her toward deeper water. Once again in deep water, we carried on the search. We were now facing directly into the waves and wind, and the ride got rougher. At one point, a large wave came crashing over the small boat and hit us in the face, drenching us completely. It reminded me of those waterpark log rides, and all I could do was laugh. Kimberly reminded me that the previous night, before we lost Lagniappe, I had told her that I wanted to go exploring and get in the water the next morning. Be careful what you wish for. The shoreline was too shallow and the seas too rough to get close by boat, so I jumped in and waded ashore to retrieve our dinghy and get her back to the fishing boat. When I got ashore I looked back toward the fishing boat. The captain was busy pouring gasoline into his tank from a jerry jug, and Kimberly was frantically bailing water with the only thing she could find – a 2-liter drink bottle that had been cut in half. Remember that big wave? It did more than just soak us, it poured a lot of water inside the small vessel. I also realized Kimberly was desperately motioning to the captain, trying to alert him that they were about to crash into the reef. He dropped the gas can, spilling gas all over his boat and, just in time, backed away from the jagged rocks. Kimberly was scanning the shore to see which beach she would swim to if she had to abandon the boat. When I got back to the fishing boat, the back end was completely underwater. We were capsizing! Kimberly kept bailing. As she did so, more water kept crashing in. That’s when the captain said calmly, “Do you have any gas in your dinghy? We’re running out.” Fortunately, I had filled our dinghy gas tank the day before, so we had at least two gallons aboard. The terminal fittings on Lagniappe’s gas tank, however, were different from the fishing boat’s, so we could not just swap out tanks. The process of pouring gas from one tank to another in heavy seas was next to impossible without spilling more than we transferred. If we had tools, we could just easily disconnect the fittings and swap them, but we did not bring any and the captain had none. We resorted to unscrewing the gas can tube fittings by hand and sticking the fishing boat gas feed tube into our dinghy tank. It was not a perfect fit, so Kimberly had to hold it down by hand to keep it in place, and press the captain’s t-shirt over it to keep seawater from splashing inside. Meanwhile, we were still desperately trying to remove water from the boat, and keep our belongings – now soaked in seawater and gasoline – from floating away. While the captain continued bailing and Kimberly was keeping the fuel line in place, I went to the front of the fishing boat to try to use my weight to lower the bow, which would raise the sinking back end out of the water. We got enough water out of the boat to get underway without sinking. The stern started floating again, and we now had gas, but we were about eight miles away from the nearest town. We had a long and bouncy ride ahead, into the 20+ knot winds, but this time, we had Lagniappe in tow, leaping wildly in the fishing boat’s wake. We were sure she was going to flip, so we convinced our guide to slow down. As much as we all wanted to get back home quickly, we weren’t about to lose our dink again! Despite our aching butts and hands, and being crusted in salt from head to toe, Kimberly and I were elated. We had our wayward child back. She left us stranded on a beach after dark; floated over nine miles alone in heavy seas; crossed the anchorage, the bay, and beyond; all the time dancing around rocky cays and coral heads. Surely she will have to be grounded for this, but at that moment, we were just relieved to have her back in one piece. We had just enough gas to make it back to our captain’s dock. After we got both his boat and Lagniappe secured, we asked him how much we owed him. In typical Bahamian style, he said “just enough to refill my gas tank.” We couldn’t believe it. This man dropped everything he was doing with no notice, took us out in heavy seas on a four-hour search, found our boat, and he wanted nothing in return. This is a man whose family had just lost almost everything in a terrible hurricane last fall, and whose town was still rebuilding. We would not hear of it, and paid him what we felt his time and great effort were worth. We are now sitting aboard Pura Vida with aching backs, butts and hands, and with Lagniappe safely tied astern. 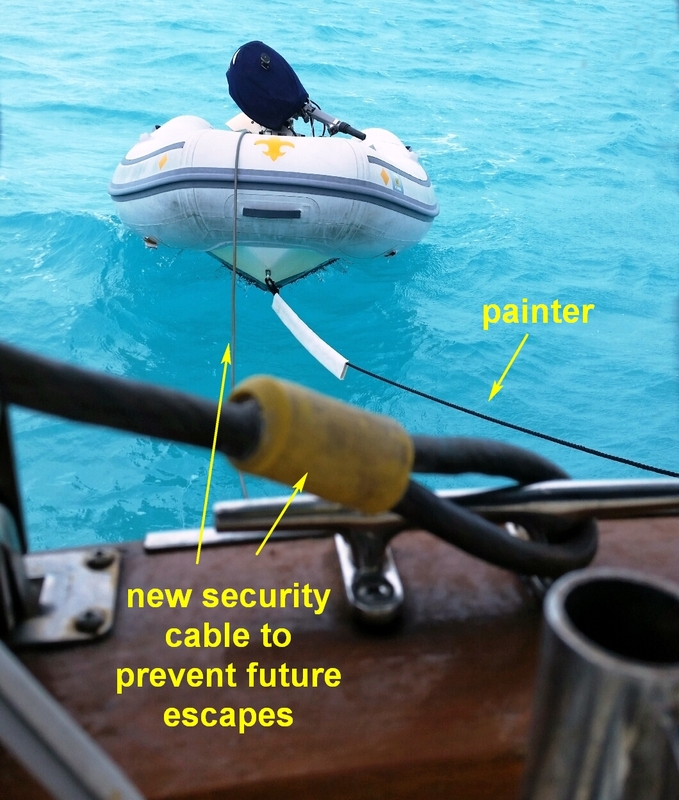 Despite being tied with a thick cable in addition to her usual braided-nylon painter (a rope used to tie a dinghy), we peek outside frequently to check on her. 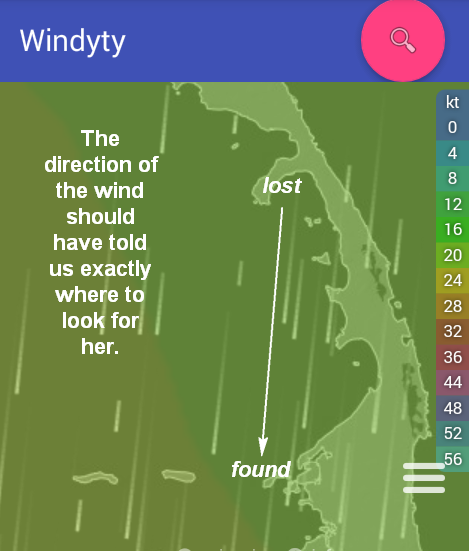 As soon as the winds die down, we plan to take her back to town to join Captain Chester for a few cold ones at the local seaside bar and grill. We continue to be humbled by the generosity and goodwill of the Bahamian. These islands are stunning in their natural beauty, but events like this remind us that the most beautiful thing about the Bahamas is the people; locals and cruisers alike! I don’t mind if we live slightly less exciting lives! Yes, we are definitely keeping her under our watchful eyes from now on. That’s actually a brilliant idea! Thanks so much for sharing your adventures. The good and the bad. By sharing your experiences you are helping those who might follow in your footsteps one day (Renee’ and I?). We hope to see y’all out here someday soon. With modern communications you could run your empire from a boat. Next blog entry will be a fun one…no mishaps…fingers crossed!